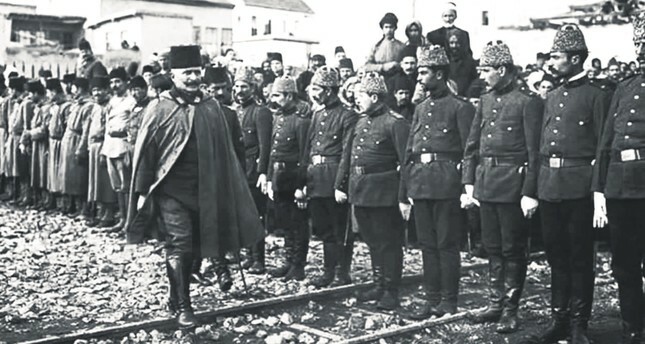 Fahreddin Pasha inspects his troops during the World War I.
Fahreddin Pasha, nicknamed "The Tiger of the Desert," is one of the most important figures in the history of Turkish people, and his defense of Medina is one of the most flattering events in this history. Süleyman Beyoğlu wrote an important doctoral dissertation about Fahreddin Pasha based on archival resources. Birol Ülker also elaborated on Fahreddin Pasha's defense of Medina and his locust-eating story in one of his articles. After Sharif of Mecca Hussein bin Ali started preparing for a rebellion, Fahreddin Pasha was deployed to Medina on May 28, 1916. Fahreddin Pasha reached Medina before the rebels and took defensive measures there. Bin Ali destroyed the railway and telegraph lines around Medina on June 3. Although he attacked Medina's outposts on June 5-6, he was repelled. When Fahreddin Pasha was defending Medina, the first thing he did was send the sacred relics in the city and some manuscripts to Istanbul so that the enemy would not seize them. Most of these manuscripts had already been sent by Ottoman administrators to the libraries in Medina. About 500 manuscripts are currently kept in the Medina Library of Topkapı Palace. "What is different from a sparrow in a grasshopper? There are no feathers of it, but it has wings like a sparrow and flies like it, feeds on plants, eats clean and fresh things, and it enjoys both tobacco and lemon. The main food of Bedouins is the grasshopper, and they owe their health and fitness to the grasshoppers they eat." Fahreddin Pasha, who reportedly had doctors analyze grasshoppers, described grasshopper meals prepared in four different ways after he had praised the creature's characteristics. Meanwhile, the Ottoman Empire, which accepted defeat, signed the Armistice of Mudros on Oct. 30, 1918. According to its conditions, Fahreddin Pasha, who was asked to deliver Medina, did not accept it. He defended Medina for 72 more days after Mudros and did not surrender. Then, Istanbul displaced him and replaced him with Colonel Ali Najib who carried out negotiations on surrender. However, the British and Arabs laid Fahreddin Pasha's surrender as a condition. The defender of Medina, Fahreddin Pasha, whose full name was Ömer Fahreddin, was born in 1868 in Ruse, in modern Bulgaria. After graduating from military school in 1891, he joined the Ottoman army as a staff captain. He served on various fronts during the Balkan Wars and World War I. Due to his brave defense of Medina, he earned the sobriquet "Tiger of the Desert." On Jan 27, 1919, he was taken to Egypt as a war prisoner. On Aug 5, 1919, he was exiled to Malta and held captive for two years and 33 days. Despite the British, he refused to take his Ottoman army uniform off, saying: "I have not taken this uniform off since I graduated from military school." While in exile, he was sentenced to death by the Nemrud Mustafa court, which was set up by the occupying forces. He was freed by the efforts of the newly founded Ankara government on Apr. 8, 1921. After serving in Russia for a while, he then returned to Anatolia. Before the siege of Medina Castle began, the Istanbul government asked Fahreddin Pasha to evacuate the castle, but Fahreddin Pasha said: "I would never bring the Turkish flag down from Medina Castle with my own hands. If you want this castle to be evacuated, better to bring another commander out here." During the siege, Fahreddin Pasha is said to have prayed constantly over the tomb of the prophet. He was often heard saying: "Rise, rise Muhammad. Rise, the prophet of Allah! And be seen to those who believe you and fight in your name. Bring Allah's help to us." On Apr. 2, 1918, Fahreddin Pasha gave a Friday sermon wrapped in a Turkish flag and said while pointing to the tomb of Muhammad: "Oh Allah's prophet, I will never leave you."